The Trail in the area adjacent to the Arapuni Suspension bridge will be closed this Thursday the 11th of April from 12 noon through to 4pm. Mercury contractors are undertaking a controlled blasting operation to remove a boulder from the river Bank. Control staff will be in the area to make sure people are outside of the affected area. Thank you for your co operation. We are pleased to advise that this section between the Mangakino Village and Waipapa Dam is now reopened. The Whakamaru Reserve in the South Waikato District is closed to camping for the summer period. The felling of the neighbouring forestry block has heightened the risk of one or more of the many aging Pine trees within the reserve loosing limbs or entire trees falling, making them dangerous to the public. Council has installed signage and gates on the reserve access roads and trails accordingly. Council had hoped to fell the trees this year and have this popular reserve open for Christmas, however we have been unable to secure a contractor to do this work before the New Year due to the contractors' existing work commitments. Council takes the safety of its reserve users very seriously. Camping can simply not be permitted with the aging trees posing such a serious health and safety risk. This includes access to the boat ramp. We remind our reserve users that there are several other reserves in the district that can be used over the summer period - Dunhams Reserve (also on Ongaroto Road), Little Waipa (Horahora Road) and Jones Landing (Lake Arapuni Reserve). 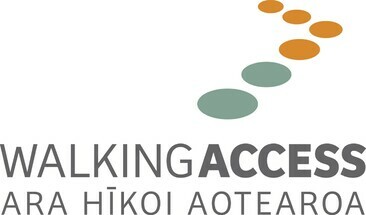 Permits are required, please visit Council's website www.southwaikato.govt.nz - Apply for it. We remind reserve users of appropriate behaviour in South Waikato reserves for the enjoyment of all reserve users - no motorbikes, no fires, keep dogs under control and be mindful of alcohol consumption. Visit Council's website for the full media statement. Check out as Justin explores the Waikato River Trails! 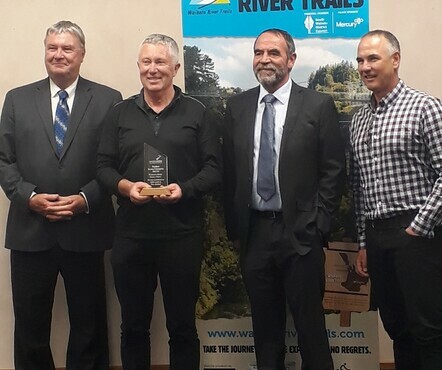 On the 12th September the New Zealand Walking Access Commission proudly presented to the Waikato River Trails Trust the Outdoor Access Champion Award for 2017-2018. This award recognises the Trust's efforts to establish and develop improved opportunities for people to access the great outdoors. "The creation of your trails, combined with the strong community involvement in replanting of riparian areas has brought great benefit to your region, and the Commission applauds the efforts of the Trust and all who have worked with it." Chairman of the Commission John Forbes commented "People in 100 years time can look back at the legacy you have left today - something we can enjoy now and tomorrow, and also into the future." The trails cover about 103km of previously inaccessible Southern Waikato land. They wind their way along a path that encompasses the magic and beauty of New Zealand native bush, exotic forest, historic landmarks, interesting rock formations and geological delights. Be inspired as you walk, run or cycle through grassed farmland, open reserves, boardwalks over significant wetlands, and expansive lake and river views.